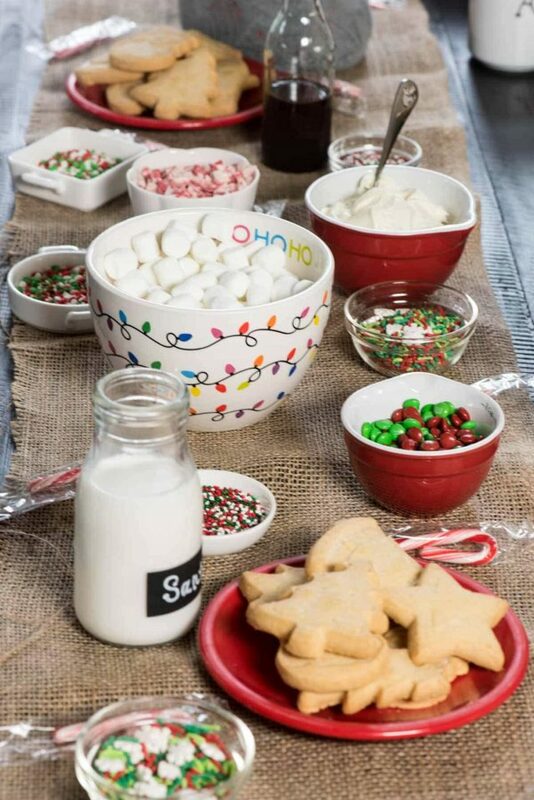 How to easily host a cookie decorating party for kids! 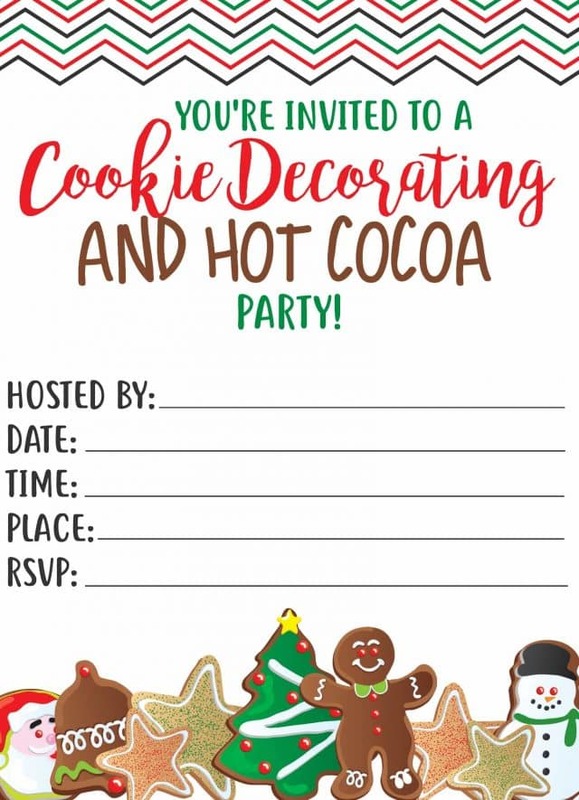 Use this free printable invitation and pre-made shortbread cookies to host a fun cookie decorating party with a hot chocolate bar. 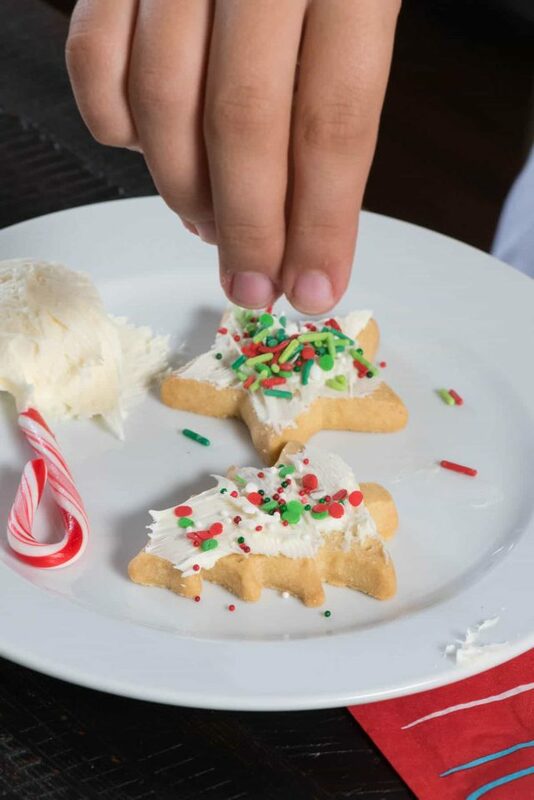 The kids will love decorating their own cookies and these tips will keep you sane during the entire thing. Using Walkers Shortbread cookies is an easy way to keep your prep to the minimum and everyone will have a great time. Every year for the past several years we’ve hosted a Christmas party for a bunch of Jordan’s friends. She looks forward to planning this party every year (well, until now, she’s too cool for it as a 7th grader) and we always have some fun activities like games or an ornament exchange to get the kids in the mood for the holidays. The activities and food might change year to year but the two constants at her holiday party are decorating cookies and drinking hot chocolate. Between her Christmas cookie decorating parties and class parties, I’m pretty much a pro at not going insane during cookie decorating. I mean, that first time you’re in the classroom while the kindergarteners are building gingerbread houses out of graham crackers it’s pure chaos, am I right? As an experienced mom, I’m here to tell you that hosting these fun parties are doable, easy, and won’t kill you, as long as you follow my easy tips and tricks for the perfect cookie decorating party. Whether you just email or text the parents or send out an actual invitation, plan to invite the kids a few weeks ahead of time. The holidays can be stressful with lots of commitments. I actually found that doing the party after school on a Friday or before the holiday break worked best for most kids. Unless they’re young, plan that kids will be dropped off (moms don’t have time to go to parties for their kids in December!) so think about that when you make your invite list. Can you handle 8 pre-teen girls? Or preschoolers? 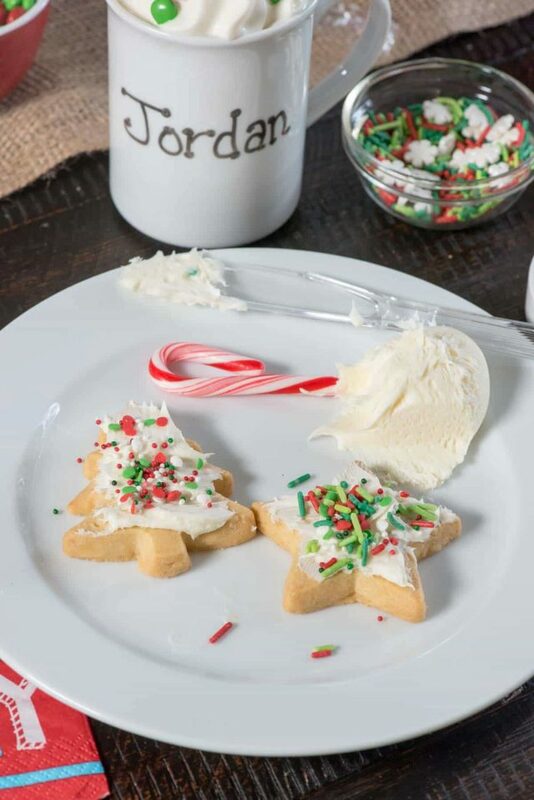 This free printable cookie decorating party invitation is yours to personalize. Download it and print it out, bonus points if your kids fill it out on their own! Download a PDF of the Cookie Decorating Party Invitation HERE. 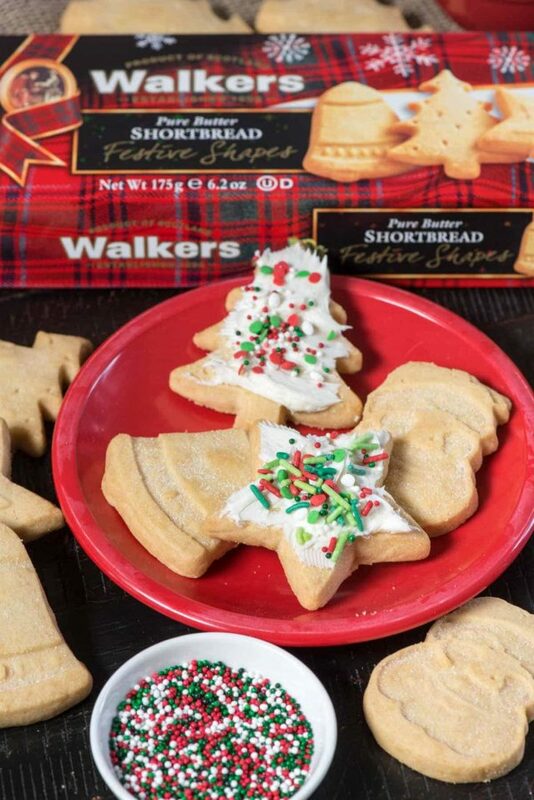 To save yourself some time preparing for the party, use Walkers Shortbread Festive Shapes cookies instead of trying to make your own sugar cookies. They taste SO GOOD and hold up to frosting. I can easily go to town with a box of these cookies and a can of frosting so I guarantee the kids will love them. 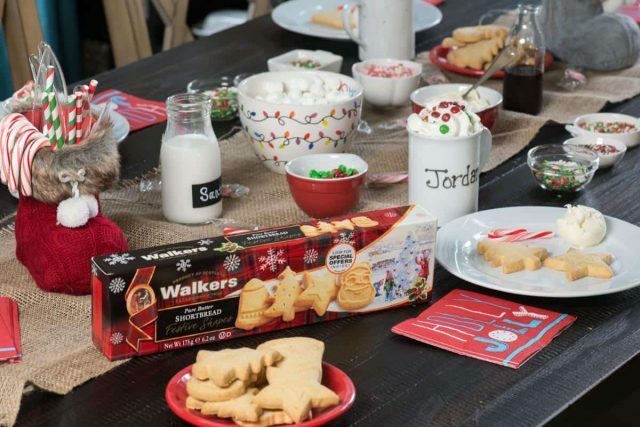 They come in several shapes to keep the kids busy decorating and you’ll be happy too: using Walkers Shortbread is a convenient and delicious way to avoid spending your precious holiday time making cookies from scratch. Tip #3: Have a seating chart. It’s easy to skip this step and just give it a free for all when the kids go to sit down, but I don’t recommend that. Kids, especially girls, are notorious for being cliquey (believe me, it started in first grade!) so we always do a seating chart. Makes my life easier because there are so many less squabbles that way. 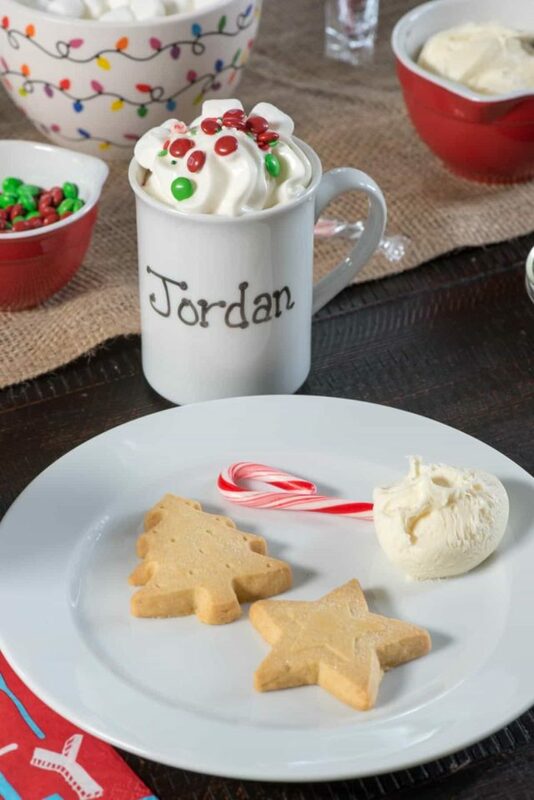 A cute way to do a seating chart is to write each child’s name on their hot cocoa mug with a dry erase marker. It’s a fun way to let your kids do something “evil” like write on the glassware, plus it makes it fun for them to drink and stops everyone from “losing” their mug. Kids get territorial so make sure to have lots of little bowls of the same kind of sprinkles scattered throughout the table. And by all means, do not give them the entire sprinkle bottle. I guarantee you one kid will pour the ENTIRE thing on their cookie. The amount of DIY hot chocolate you do kind of depends on how old and how responsible the kids are. For younger kids, pour the hot chocolate for them and add the toppings, asking them what they like. As the kids get older you can give them more reign with that, but expect them to pile on the whipped cream if left to their own devices. Hot chocolate, obviously! You can use the powder to make a pitcher or use k-cups, but I love making slow cooker hot chocolate. It feeds a crowd! Whipped cream (save time, buy it in a can). This is something I learned after Jordan’s first cookie decorating party back in Kindergarten. Some mom handed each table a can of frosting and a bunch of plastic knives. Before I knew it the kids were double dipping knives after licking them and it was all I could do not to pour lysol all over Jordan. Save yourself the flu bug at Christmas and give each kid a dollop of icing and their own plastic knife. 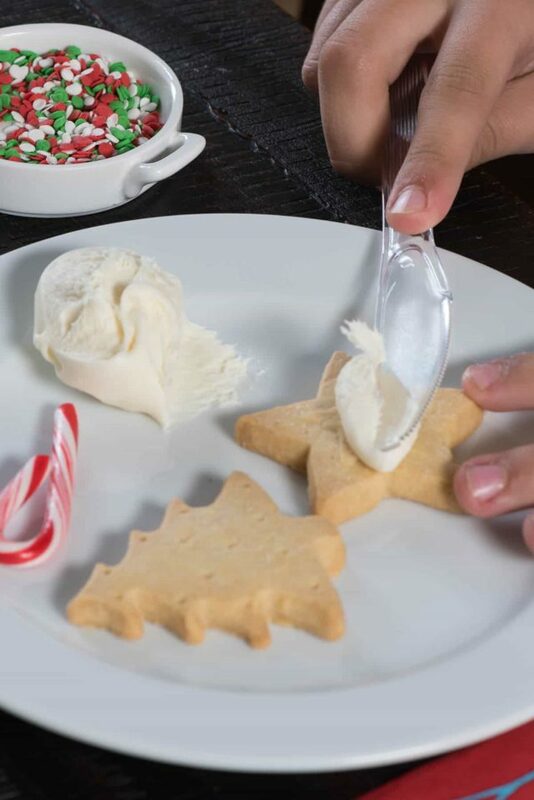 You can control how much icing they use AND if they lick the knife there is no double dipping. As they get older this is less of an issue, and they might also want piping bags to do more intricate designs. As for the frosting, feel free to make my favorite cookie icing but really, a can works just fine for the kids. Depending on what other things you’re doing at the party, you’ll want to limit how many cookies they eat. If cookie decorating is just one activity, I’ll give each kid two cookies and they just eat them. But if that’s the main thing keeping them busy, you’re going to want them to make more than 2. These make a great gift for a neighbor or a grandparent, or even to take to a nursing home for seniors. If you have older kids who want to decorate lots of cookies, give them each a box of the Walkers Shortbread Festive Shapes so they can decorate all of them. Then package them up in cute little boxes or tins that are great for giving. Tip #9: Make sure there is a firm end of party pick-up time! This post was sponsored by Walkers Shortbread. All opinions are 100% my own. omigosh a Christmas party for her friends that is so sweet! And I love all the tips! Good suggestions! One of the best was a firm pick-up time. I experienced one mom coming to pick up her daughter 45 minutes after everyone else left. And your invitation was darling! Very wise on setting an end time in stone from the get-go! I’ll need to remember that. Much better than shouting “look everyone! A shooting star!” and locking the door. Thank you for the invitation! It is perfect. I just wanted tell you that after reading this post, I decided to have a party like this for my daughters and their friends and it was so awesome!! I used all your tips, from the invite to the crockpot hot chocolate with all the fun toppings. The Walkers shortbread idea was a lifesaver and so good. All the girls had a blast decorating cookies together. Thank you so much for the fun (and easy) ideas! !